Sorry to be so late this week - my DSL has been messed up since last week. Nothing to do with the earthquake or hurricane Irene - just lousy service from Verizon. 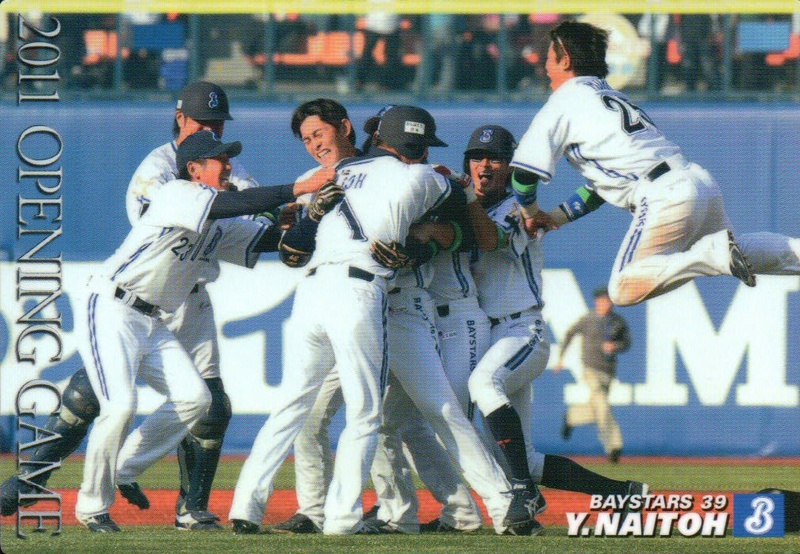 This season the Orix Buffaloes decided to celebrate the 1970s' versions of the two teams that merged in 2004 to form the current team - the Orix Blue Wave and the Osaka Kintetsu Buffaloes. These teams were known as the Hankyu Braves and Kintetsu Buffaloes back in the '70s. Orix had a couple sets of games earlier this season in which they wore retro uniforms of each of the teams. There's an official website dedicated to these games and BBM put out a set in conjunction with it as well. While BBM's website says that the set has 99 cards, it actually only has 96. 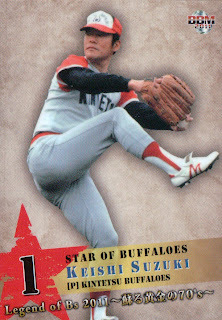 There are 19 cards for the 2011 team (who are not shown wearing the retro uniforms since the set was released before the games, however it is the first set showing all the players in the new for 2011 Buffaloes uniforms), 30 cards for OB Hankyu players from the 70's, 27 (not the 30 listed on the website) cards for OB Kintetsu players from the 70's, two "Memorial Scene" cards and two nine card subsets entitled "Star Of Braves" and "Star Of Buffaloes" that also feature OB players. The OB subsets feature the managers for each team during the 1970's. 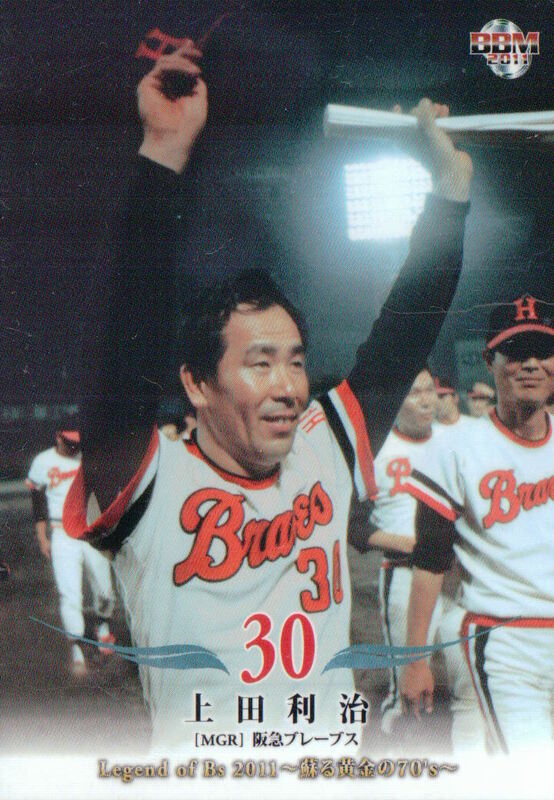 For the Braves, that's Yukio Nishimoto, Toshiharu Ueda and Takao Kajimoto. For the Buffaloes, that's Osamu Mihara, Takashi Iwamoto and Nishimoto again (so yes, he has two cards in the set). For the players themselves the set includes Yutaka Fukumoto, Bobby Marcano, Hideji Kato and Hisashi Yamada for the Braves and Keishi Suzuki, Masataka Nashida and Masahiro Doi for the Buffaloes. 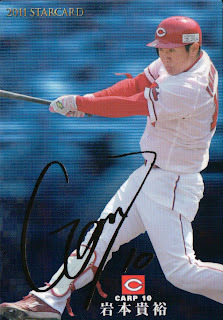 I don't know either team well enough to know if someone substantial is missing - the biggest name I can think of who isn't included in the set is Charlie Manuel for the Buffaloes. 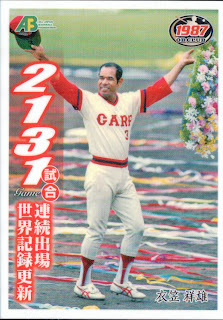 The "Memorial Scene" cards feature a photo of a significant event for each team. For the Braves, it's the team marching around the field after winning the 1975 Nippon Series (the first ever for Hankyu and the first of three consecutive that they would win in the 1970's). 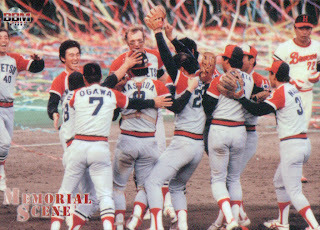 For the Buffaloes, it's the team celebrating after defeating the Braves in the 1979 Pacific League playoffs, which propelled Kintetsu into the Series for the first time ever. 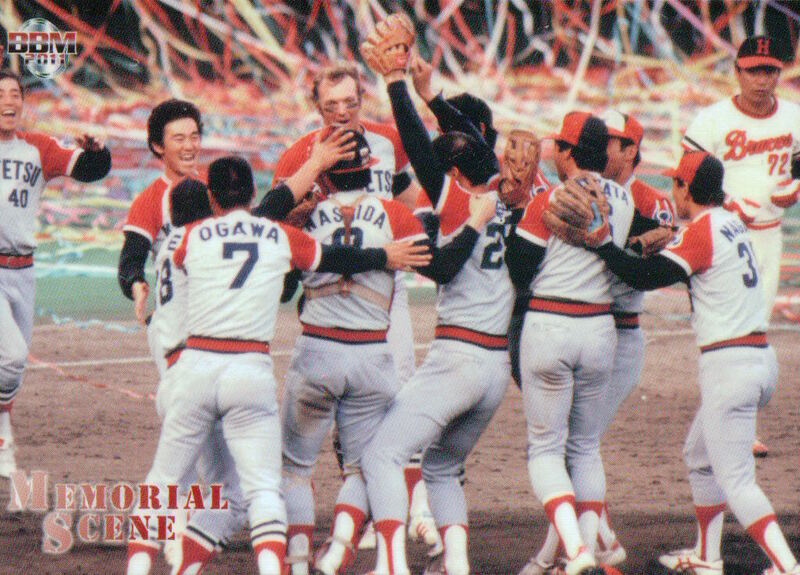 If you look closely at the players in the picture, you can see Charlie Manuel - I think he's starting to hug Masataka Nashida. 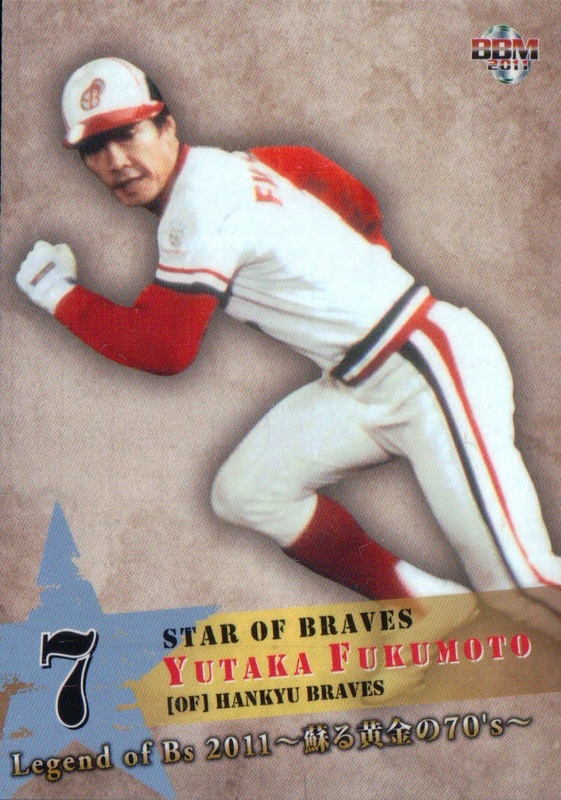 The "Star Of Braves" and "Star Of Buffaloes" subsets are nine cards each, but they are not Best 9s. Instead, they're just a collection of players from each team - I guess they're meant to be the "biggest" stars for each team. Here's some sample cards - you can see all the cards at Jambalaya's website. The Cal Ripken World Series wrapped up today with Team Japan defeating the Ohio Valley team 7-0 for their first ever championship. Japan dominated the tournament, going 8-0 while outscoring their opponents a whopping 97 to 9, including a 31-1 defeat of Canada and a 21-0 defeat of Australia. They had one tight game against Mexico, winning a squeaker 2-1. 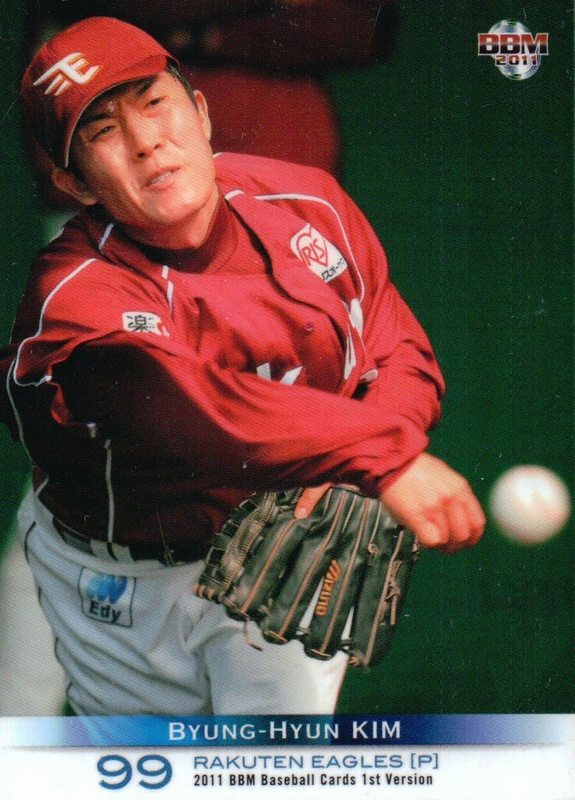 One of their pitchers, Kazuki Sakurai, struck out 28 in 11 2/3 innings, including eight of the nine batters he faced in championship game. Following up the popularity of their 1977 set late last year, the All Japan Baseball Foundation released a set last spring celebrating the 1987 season. 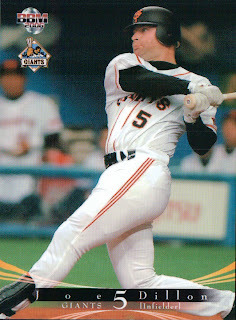 The set contained 59 "regular" cards - 48 player cards, 10 cards for highlights of 1987 and one checklist card. I'm not sure what the criteria was for selecting the players for the set, but there seems to be some major omissions. Neither MVP (Kazuhiro Yamakura and Osamu Higashio) appears in the set and the CL Rookie Of The Year Yukio Arai does not either. 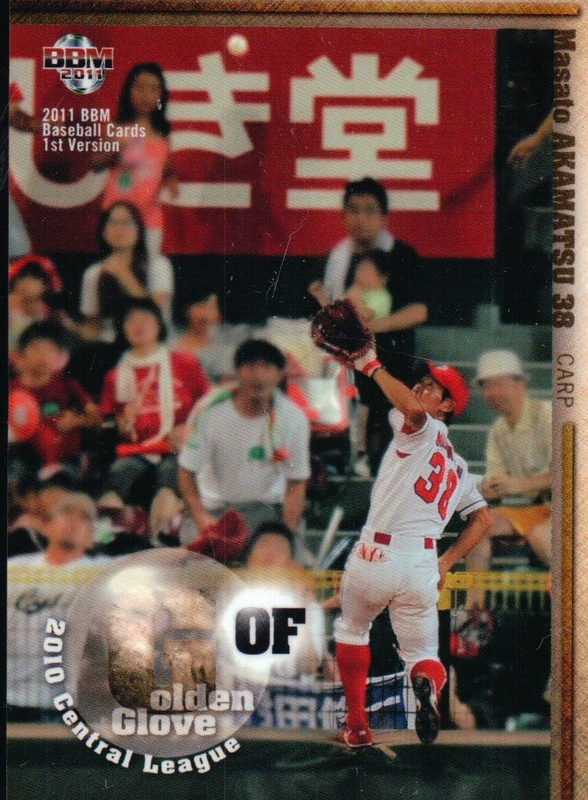 Only the Sawamura (Masumi Kuwata) and the PL Rookie Of The Year (Hideyuki Awano) are in the set. Only four members of the CL Best 9 and five members of the PL Best 9 are in the set. 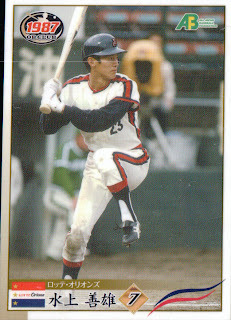 Part of the problem is that (like the 1977 set) there are no gaijin included, so no Boomer Wells, Tony Brewer, Warren Cromartie, Bob Horner, Randy Bass, Rick Lancellotti or Carlos Ponce. No Kimyasu Kudoh, Tsutomu Itoh, or Hiromitsu Ochiai either. It's hard to do a comprehensive set for a season when you leave out half the significant players. So I guess I'd have to say that I'm a little disappointed in this set. I really liked the 1977 set but this one isn't nearly as good. BBM listed a couple more new sets this week on their website. I think they're now caught up with everything that was listed on AmiAmi. - This year's edition of the All Star set will be released in early September and for the first time in several years I don't think the design is completely hideous. As usual, this is a box set containing cards of every player who made the All Star roster as well as the manager and coaches for each league. 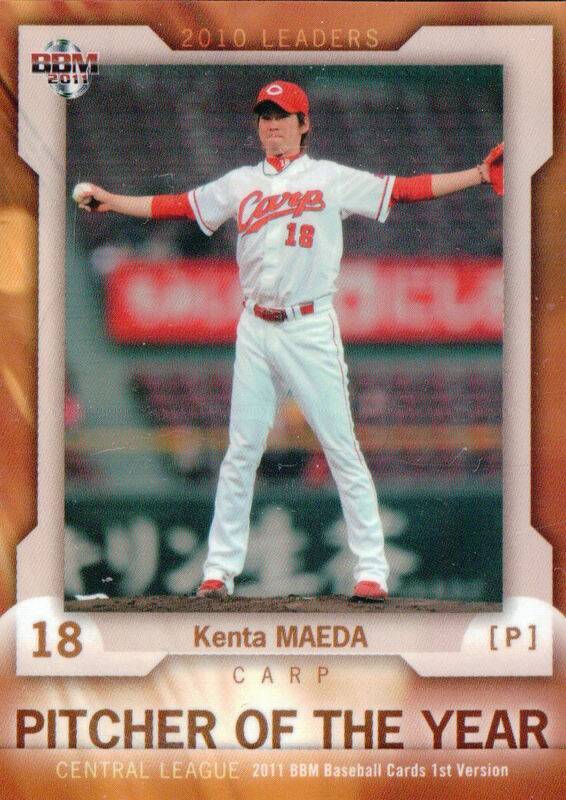 In addition, there are cards for the MVP of each of the three games this year (Kazuhiro Hatakeyama, Takeya Nakamura and Atsunori Inaba) for a total of 73 cards altogether. If I'm reading the web page correctly, this will be the first time since the 1990's that there is not a card of the top vote getter in the fan balloting. - The Tokyo Big Six Autumn Version set is a boxed set containing 38 cards - 36 "regular" cards (team card and five players per team) plus two insert cards - one "Heroes" card featuring an active Tokyo Big Six player and one "Legends" card featuring a former player. There are six possible cards in each insert set - one for each team. 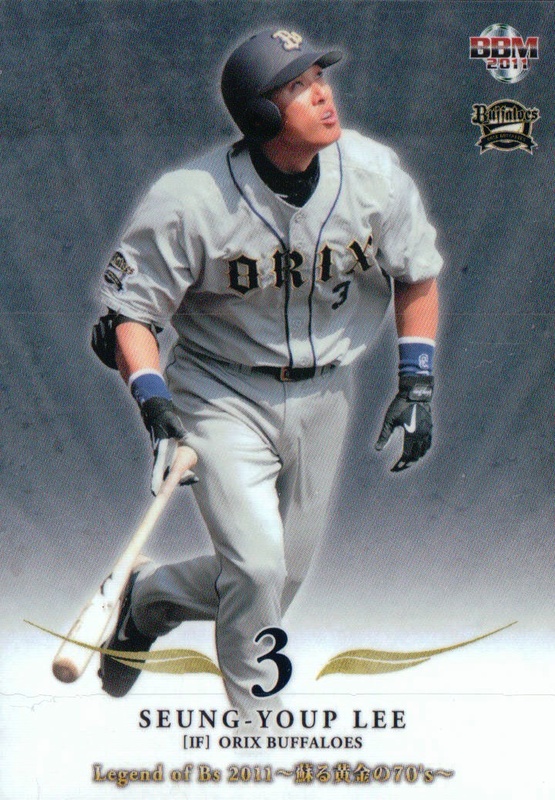 Unlike the Spring set, it looks like the "Legends" set contains OB NPB players rather than active NPB players - the sample cards include Shigeo Nagashima (Rikkio), Koichi Tabuchi (Hosei), Daisuke Yamashita (Keio), Katsumi Hirosawa (Meiji) and (I think) Akinobu Okada (Waseda). (I'll be curious to learn who the "Legend" from Tokyo is - the wikipedia page for the league lists a film director as the only "notable alumni" from Tokyo.) The set will be released in mid-September to coincide with the beginning of the Fall season. - BBM is branching out in their collegiate sets this fall with the release of an 80th Anniversary set for the Tohto University Baseball League. 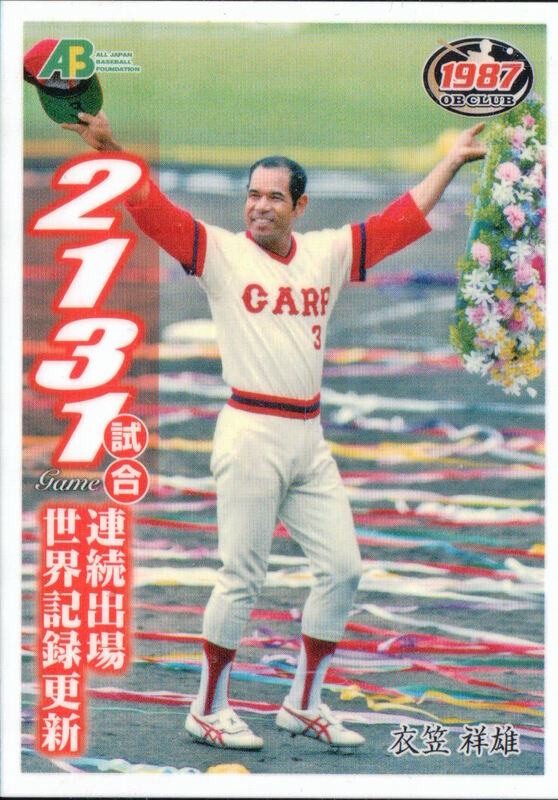 This will be a pack-based set containing 99 "regular" cards - 45 cards of retired former players from the league, 45 cards of former players still active in professional baseball and nine cards for "Record Holders". There is also an 18 card insert set called "Super Best 9" and possible autograph and photo cards. What the set does not have is any currently active collegiate players from the league. The release date is not listed here, but AmiAmi's listing has it as late September. Based on these two collegiate sets, I'm kind of hoping that BBM's going to do two things in the future. 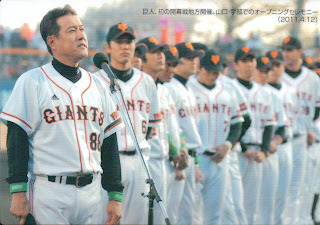 The first is that they do an OB set for the Tokyo Big Six league. 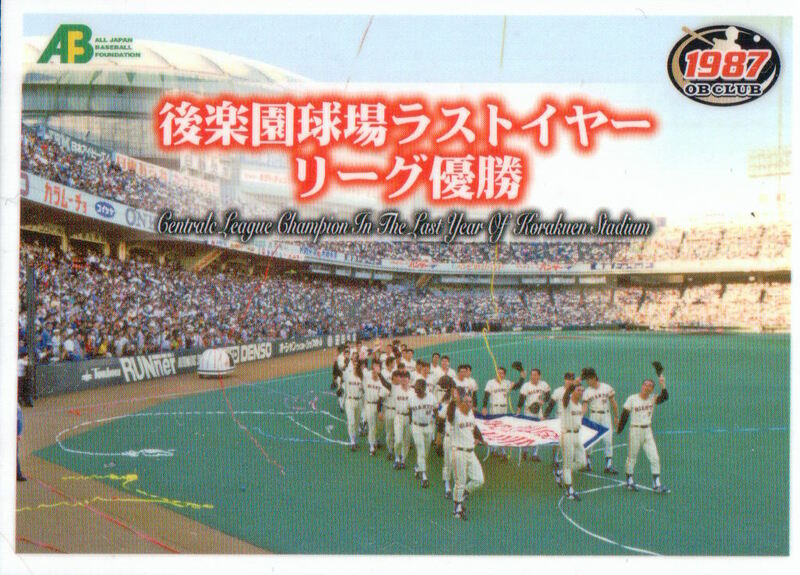 I think 2012 will be the 85th Anniversary of the league (started in 1925, but shut down for a couple years during the war - Tohto started in 1930 so the 80th Anniversary only makes sense if you take into account the years they didn't play during the war), so that might be the perfect excuse to do the set. The second is that maybe they'll consider doing a regular set for the Tohto League. The main problem with doing the set is that BBM insists on having the same number of cards for each team and there's 21 teams in the league! 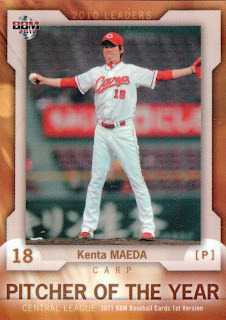 Maybe the answer is to do a team card and two player cards for each team, so there'd be a total of 63 cards in the set. 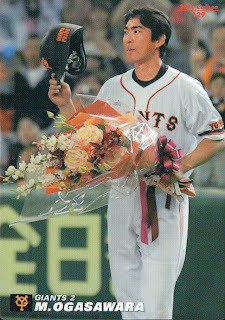 - I don't believe that he's officially retired yet, but BBM is releasing a box set devoted to Kimiyasu Kudoh. Entitled "Never Give Up", the set contains 28 cards - 27 "regular" cards along with 1 possible memorabilia card. It will be out in late August. 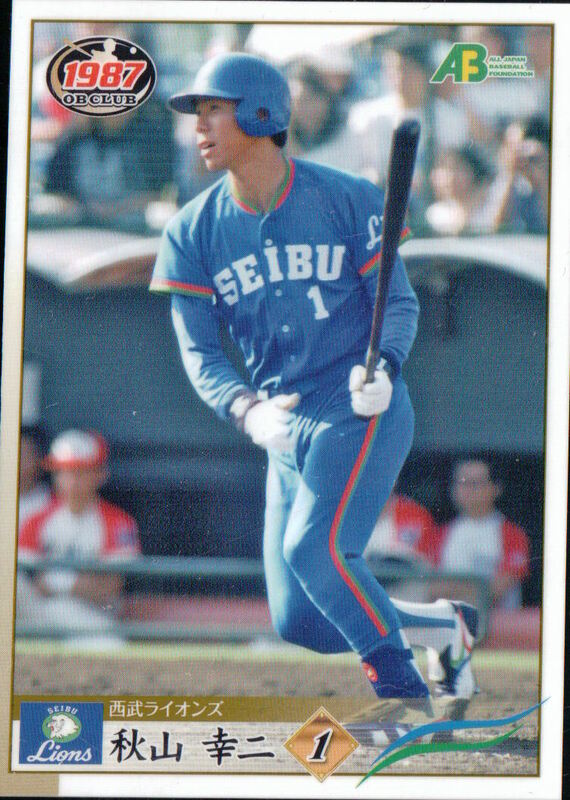 - Following the 1991 season, the Lotte Orions moved across Tokyo Bay from Kawasaki to Chiba and renamed themselves the Chiba Lotte Marines. 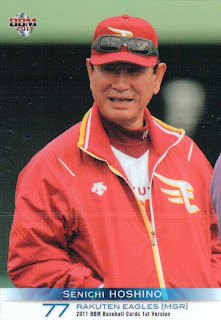 To celebrate their 20th season in Chiba, BBM is issuing a 20th Anniversary Marines set in early September. 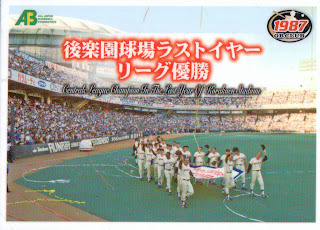 This pack based set pretty much follows BBM's standard pattern for their Anniversary sets - it's a 99 card set containing 7 cards for "Marines History", 28 cards for the 2011 team, five cards for former managers, 45 cards for OB players (both retired and active ex-Marines), five cards for career leaders and nine cards for single season title holders. 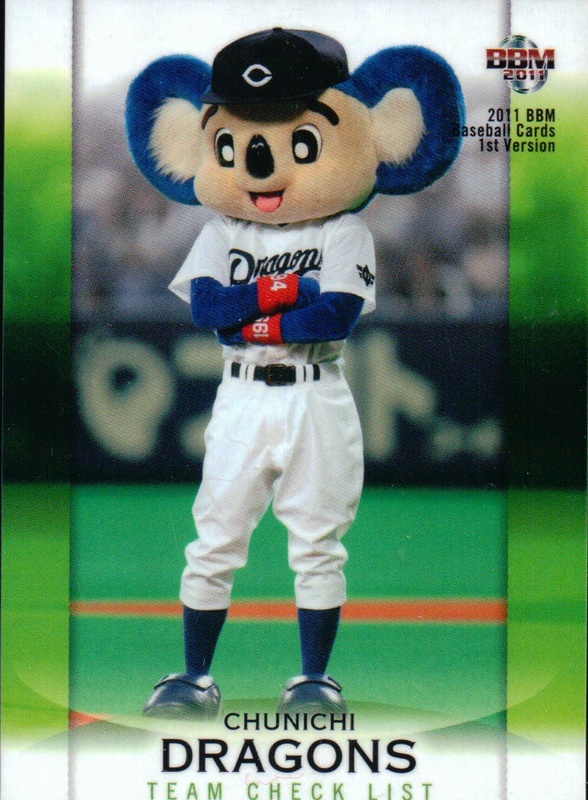 There's a nine card insert set called "Pride Of M's" (with additional possible foil parallel versions) as well as the usual suspects for memorabilia cards - autographs and jersey cards. - Well, another year, another Lions OB set. This year's edition is entitled "Lions Classic 2008-11" and it commemorates the Lions Classic games (a number of games that the Lions play each year wearing retro uniforms) for the last four seasons (despite the fact that BBM has already issued sets commemorating these in 2008, 2009 and 2010). 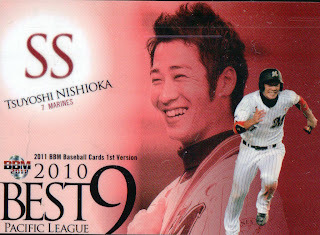 This is a pack based set containing 99 "regular" cards. It looks like there's a subset for each year's Classic. 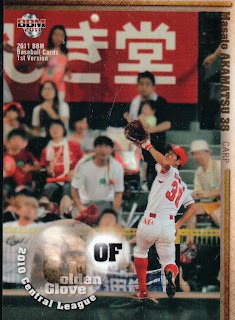 Each subset contains cards of active players in retro uniforms as well as OB players from the era represented. I'm not sure I'm reading the web page correctly, but it looks as if there's an 18 card (9 active player, 9 OB) subset for the 1951 era (2011 Classic), 24 cards (12 active, 12 OB) for the 1950's era (2008 Classic), 18 cards (9 active, 9 OB) for the Taiheiyo Club Lions from the 1970's (2010 Classic) and 27 cards (12 active, 15 OB) for the 1980's Lions (2009 Classic). 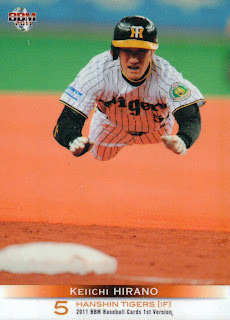 There's also a 12 card subset containing some sort of combination card showing an active and OB player. 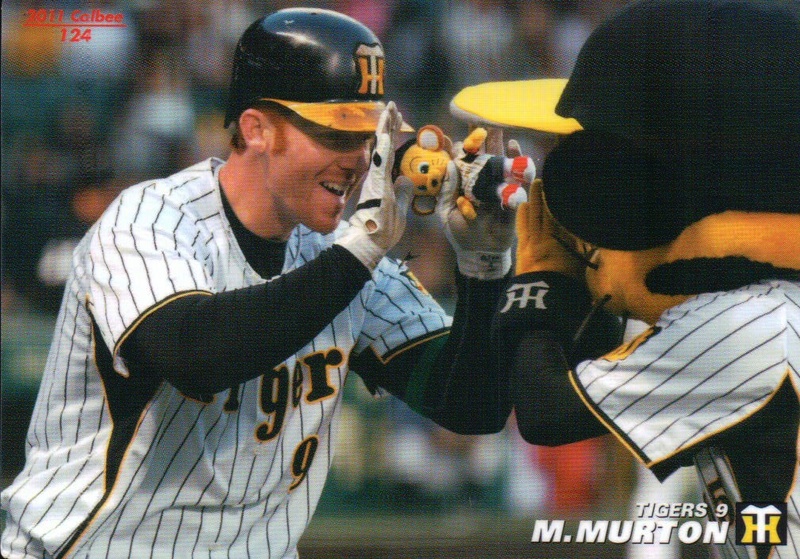 There's a nine card inert set called "Classic Seed 9" featuring active players and various autograph and memorabilia cards. The set will be released in late September. In addition to the sets on BBM's website, AmiAmi also lists two new college sets from BBM - the Autumn Version of the Tokyo Big Six set and an 80th Anniversary set for the Tohto University Baseball League. 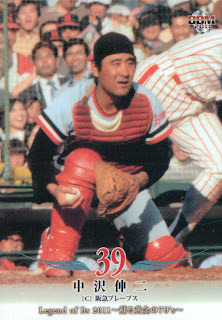 I've always liked it when I can identify what game the photo on a particular baseball card was taken at, although I usually have a hard time with Japanese cards. 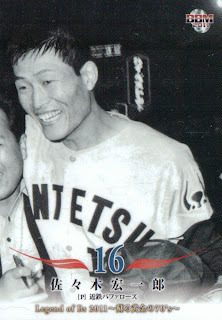 But this card of Hayato Sakamoto (2011 BBM 1st Version #231) had some major clues - Sakamoto looks pretty happy and there's a pitcher (Hisashi Takeda of the Fighters) who looks like he's walking off the field. 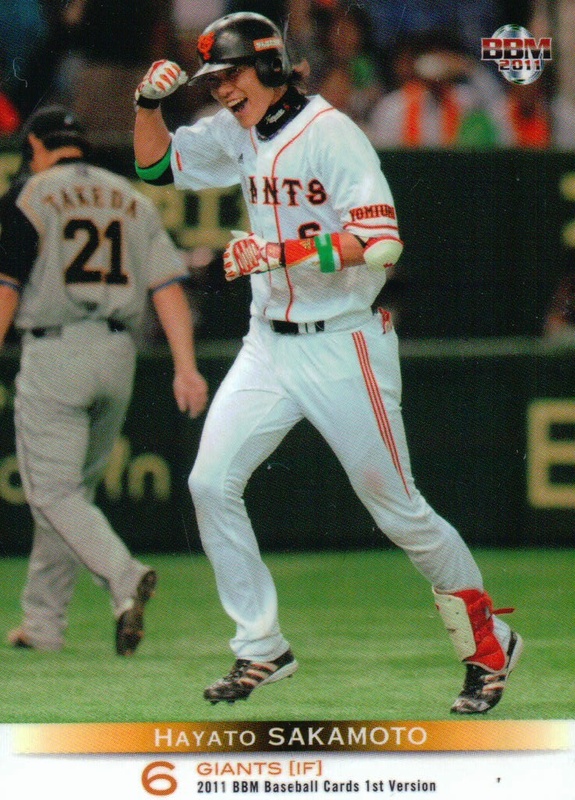 A little searching on NPB's English language website reveals that on June 4 last year, Sakamoto hit a two run sayonora home run off Takeda to lead the Giants to a 7-6 victory. UPDATE: I should have checked this before, but Deanna was at this game and posted about it. I'm getting slower and slower in getting around to writing about sets this summer. BBM's 1st Version set came out in late April and it's taken me four months to get around to writing about it. (In my defense - I just got my set a couple weeks ago.) But just in case everyone doesn't already have the set, I'll still do a quick write-up on it. 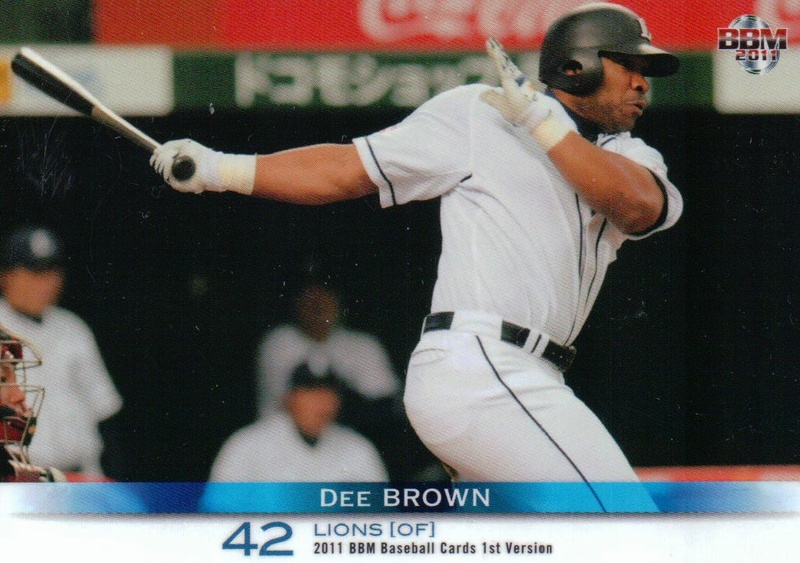 At 418 cards, this year's set is much smaller than those of the last couple years. BBM has also changed things up a little by making the standard insert sets for Best 9 and Golden Gloves be subsets in the regular set instead. I have to say that I'm kind of disappointed with this set. While I'm happy that the Best 9 and Golden Glove sets are part of the regular set, I'm not happy that they dropped nine players for each team. I don't have any sort of comprehensive list of who's missing, but I was surprised there was no Yusei Kikuchi card - especially since he was almost as hyped last year as Yu-Chan is this year. Not that there's really a choice if you want a big Japanese set - Calbee's got fewer cards and the Konami and Owner's League sets are hard to come by. UPDATE: I forgot to include a link to the page on Jabalaya's website that shows scans of all the cards (including some of the inserts and parallel issues). OK, quick - what foreign player has gotten the most hits in NPB? Leron Lee? Good guess but wrong. Bobby Rose? Wally Yonamine? Leon Lee? Boomer Wells? No, no, no and no. Tuffy Rhodes? If I had asked this last week, then yes. But this week, no. BBM's website released information about this year's edition of the high-end Touch The Game set a couple weeks back. The set will contain 120 "regular" cards - 108 regular player cards (9 per team) and 12 rookie cards (1 per team). 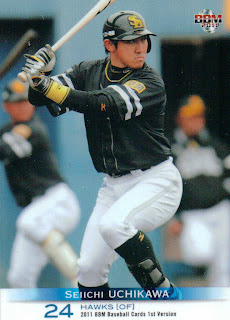 As usual, there's a boatload of memorabilia cards available - ball, jersey, patch, autograph, etc. 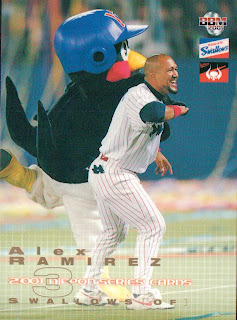 BBM is making a big deal about this being the 10th Anniversary of Touch The Game, so I think some of the memorabilia cards are from previous editions. The translation of the web page uses the word "FINAL" a couple times, so I wonder if that means that BBM is discontinuing this set in the future. The set will be out in late September. In addition to what's on BBM's website, AmiAmi has a listing for the annual BBM All Star set as well as a box set for Kimiyasu Kudoh (also from BBM). Jason has brought a couple interesting on-line resources to my attention lately. 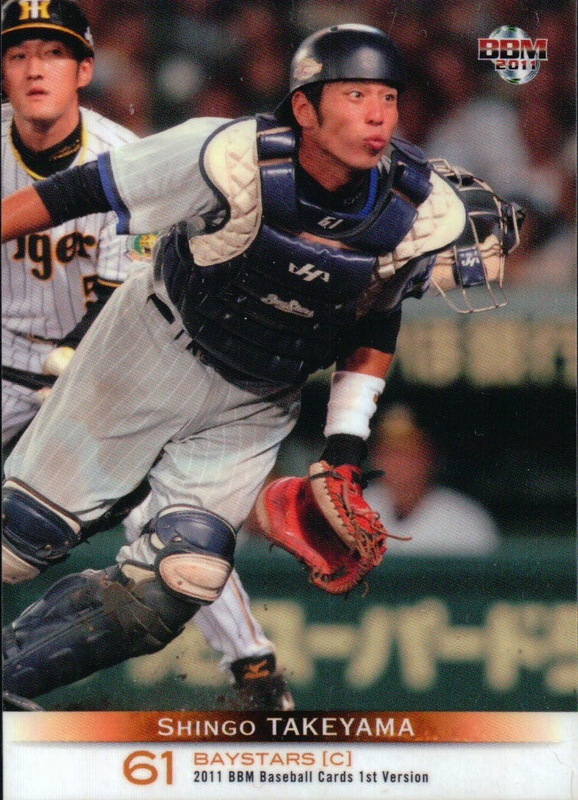 I mentioned the first yesterday - Yahoo Japan Store called Jambalaya that no only lists all the cards for a set, but shows scans of most of them as well. So far they only have BBM, Calbee and All Japan Baseball Foundation sets from 2011 up. Great place to browse and see who's in a set and what the cards look like (especially since I'm pretty slow in getting cards in most of the time). The second resource is one that Jason himself is primarily responsible for - he's been entering a lot of Japanese sets into the Inventory Manager at the Sports Card Forum (SCF). He's done all the Calbee sets from 1986 to the present, all the BBM base sets 1991 to the present and all the other BBM sets up to 2004. 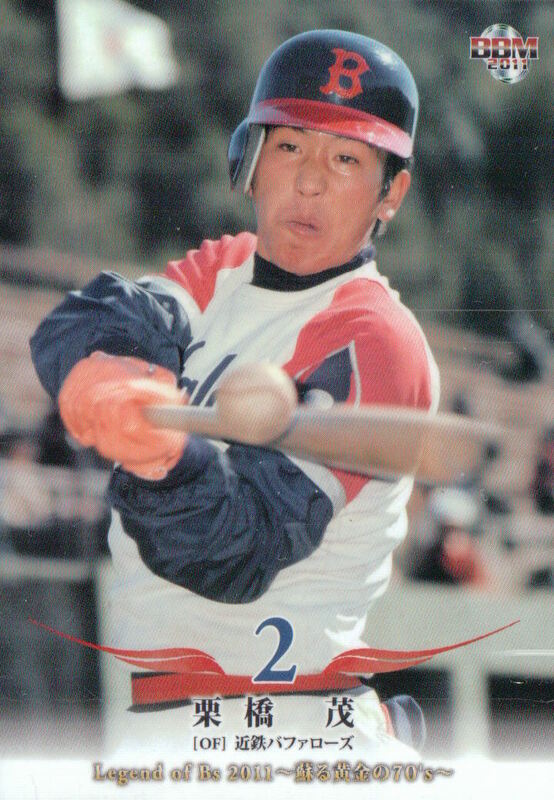 There are some other sets included as well that may have been done by someone other than Jason - Takara, Upper Deck, Konami, 1987 Play Ball, 1990 Lotte (but not 1989), 1979 TCMA. There's some listings from earlier Calbee sets but the ones I looked at from the mid-70's only include the Sadaharu Oh and Shigeo Nagashima cards. Jason kept telling me he'd been working on this, but until today, I had never been able to find the listings. Turns out that you must register and log in with SCF to be able to search these listings. 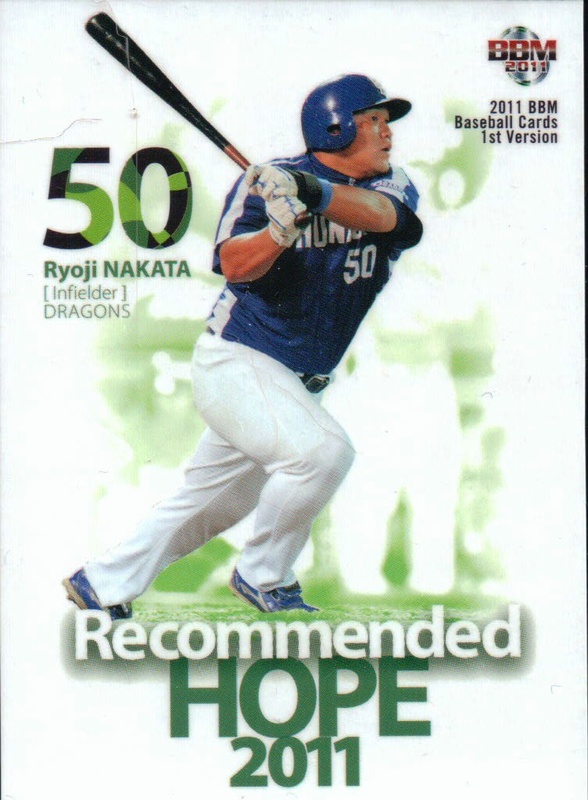 I can't find anyway to simply browse a set's checklist but you can search for a player by name and get a listing of their cards (and from that listing you can click on a card from a particular set to get a checklist for the set). So thanks to Jason's hard work, there's a way to get a list of all the cards of a Japanese player. Thanks Jason! After I was so happy with ordering the Fighters Future Icon set from Rakuten Global Market a few weeks ago, I decided to order a box of Calbee Series 2 from them. The good news was that the box was about $22. The bad news was that since the box contained 24 bags of potato chips (each with a pack of two cards attached), it weighed between 3 and 4 pounds, so EMS shipping (the only choice from Rakuten) to the US was over $40! Yow! I hadn't realized how bad it would be until I had already placed the order (it isn't entirely clear how much shipping is when you place your order). I don't think I'll be doing that again. On the plus side, however, I was very happy with the cards themselves. I got an amazing 47 unique cards out of the 48 cards in the box. I got 35 "regular" player cards (plus the double of Tadashi Settsu), 5 "Opening Game" cards, 6 "Star" cards (including a gold signature parallel card for Takahiro Iwamoto) and one checklist card. UPDATE: Almost forgot - Jason had sent me a link to a store website that shows scans for all the cards in a bunch of this year's sets. 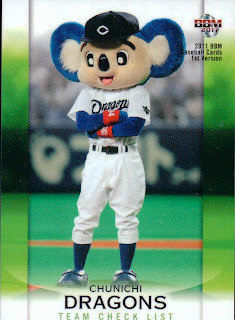 The Calbee Series 2 cards can be found here.